As a contractor you may not think you need insurance since you probably don’t have clients come to your premises. After all, bodily injury is the biggest concern, right? This is not always the case. There are so many insurance policies that may apply to your unique situation. 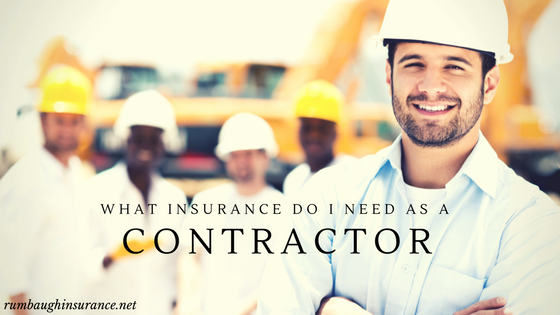 It is important to discuss everything you do as a contractor with your insurance agent. Here are some of the most common policies you may need and what they cover. General Liability – An easy way to think about this coverage is it will provide protection for general issues that may arise out of the course of your work. Scenarios include if someone slips and falls and becomes injured or you damage someone else’s property. Property damage coverage is especially important if you are going to a home or business. Property – As the name suggests, you should have property protection if you have an office or any business personal property that you may need coverage for including computers. It is important to note that this is not where you would cover tools or equipment. Inland Marine/Equipment Floater – The name varies depending on the company. This is where you will cover damage to your equipment or tools. This policy is for anything that is mobile, or able to be moved. Commercial Auto – You probably have some vehicles you use within the course of your business. These should be covered on a commercial auto policy, because a personal auto policy excludes business use. If your employees use personal vehicles for business, it is also important to ask about hired and nonowned auto insurance. Workers Compensation – If you have employees, you have a duty to provide them with injury protection should they be hurt on the job. In addition, this will provide your employers’ liability coverage, should any lawsuits arise from the injury. There are some other important coverages to consider which include professional liability, bonds, and errors & omissions. Contact us today so we can discuss your situation and recommend a protection plan that covers your contractor business.